Where were you on Royal Wedding day? If you’re in the UK, there’s a fair chance you were one of the estimated 24 million people watching the event on TV or the hundreds of thousands lining the streets of London. Me? I was on my way home from Butlins in Bognor Regis. Yes, I know all the jokes. Chances are I’ve cracked most of them myself. It’s all very Hi-De-Hi (but with no one playing a xylophone over the PA and announcing “Good morning, campers” in a cheery Welsh accent). It is positively chav-tastic. (I’m pretty sure the entire population of Essex was here with us.) And the place is overrun with childish screaming (and that’s just the parents). But it is also the ideal place to take the kids for a few days of fun without requiring either a second mortgage or a bail-out to fund it. 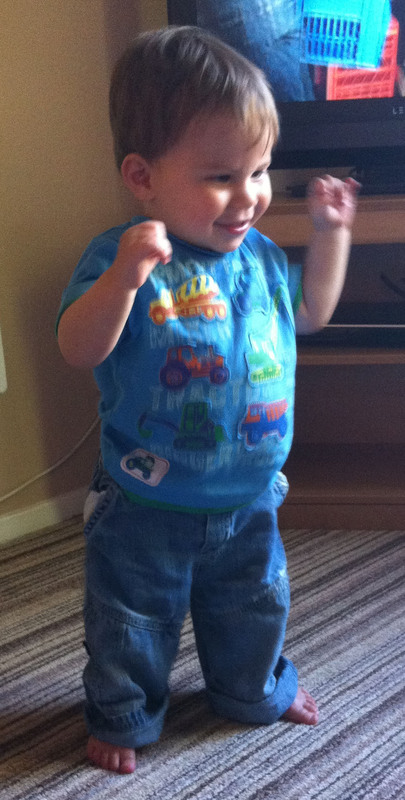 The highlight of our first day, however, was the sight of Toby taking his first steps. Grinning manically, he tottered four steps across the room into Grandpa’s waiting arms – and then did it again for good measure. He seemed very pleased with himself, and rightly so. By the following morning, we were settled into our daily holiday camp routine. Zac would, as usual, wake up at the crack of dawn, closely followed by Toby. Breakfast. Swimming. Play. Lunch. Naps (the boys and Grandpa). More play. Boys’ dinner. Boys’ bedtime. Our dinner. Avoid organised entertainments involving Stavros Flatley from Britain’s Got Talent. (I’m not joking.) And relax. It was a simple yet comforting routine, one designed to give the boys as many opportunities to enjoy themselves as possible. And, without the day-to-day encumbrance of commuting, work, household chores and cursing the Sky+ box being full again, it freed up actual leisure time to enjoy simple activities such as reading a book, or serendipitous pleasures such as randomly discovering Top Gun and Ferris Bueller’s Day Off were being shown on TV and watching them just because we could. As for the boys, fun took on a number of forms. In Zac’s case, this varied from running around half-naked in water fountains to being whizzed around in a go-kart and watching the Bob the Builder stage show. Toby got to splash about in the pool, pet farmyard animals and sit on toddler-friendly coin-operated rides. And we got to watch the boys enjoying all of this – it’s immensely gratifying to watch their beaming smiles – while occasionally sneaking off to have a bit of time to ourselves in the evening thanks to us having Grandma and Grandpa along with us for the week. So that was our week between the two four-day weekends. Five days in Bognor Regis. And as Kate Middleton was walking up the aisle in Westminster Abbey at 11am last Friday, we were just pulling up outside the aquarium in Portsmouth and attempting to rouse Zac from his slumber. Our week was somewhat less glamorous than that of the new Duchess of Cambridge’s, but I wouldn’t have swapped it for the world. Posted in Travel and tagged Bognor Regis, Butlins. Bookmark the permalink.